Aubergine is a Cape Town icon. It opened its doors in the suburb of Gardens in 1996. Set in a stylish building that dates back to the early 1800s, it’s an elegant place where you’re guaranteed top-quality food from Chef Harald Bresselschmidt. You feel like good things are going to happen when you walk through the door at Aubergine – and they do. We started off with aromatic Hendricks gin and tonics complete with cucumber slices on the lovely terrace. It’s surrounded by frangipani trees and the magnificence of Table Mountain towers behind you in the near distance. You can see influences from East and West in Harald’s cooking and there’s an abundance of local ingredients in evidence. There’s also a sense of anticipation – I organised tonight’s dinner for a group of holidaymakers from the UK and I’ve told them to expect great things! We soon got them. I must admit I’m partial to an amuse bouche. The literal translation from the French is ‘mouth teaser’ and the idea behind it is to prepare guest for the meal and offer a glimpse into the chef’s approach to food. 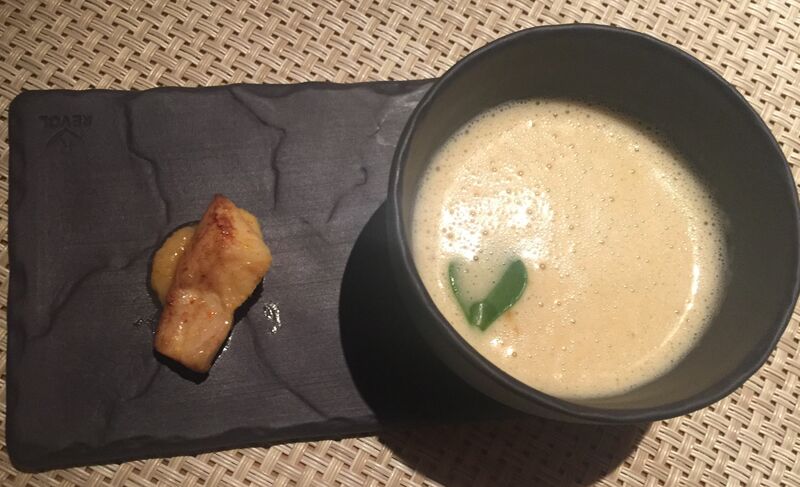 Tonight’s offering, a light, foamy, spicy cauliflower soup was served with a morsel of the tastiest kingklip (local white fish) on a beautiful slate obviously made specifically for this dish. The start to a wonderful dining experience – and a small insight into Harald’s innovative approach. Because we were a big party the menu had been slightly pared down for us to a choice of three dishes for each course. Works for me, less menu decision making can’t be a bad thing. I didn’t hesitate when it came to the starter. Vitello tonato is one of my favourite dishes ever and this was Harald’s take on it. The veal was served with Serrano ham and marinated with porcini mushroom oil, yellow beets and anchovy mayonnaise. Such a wonderful mix of flavours and textures. 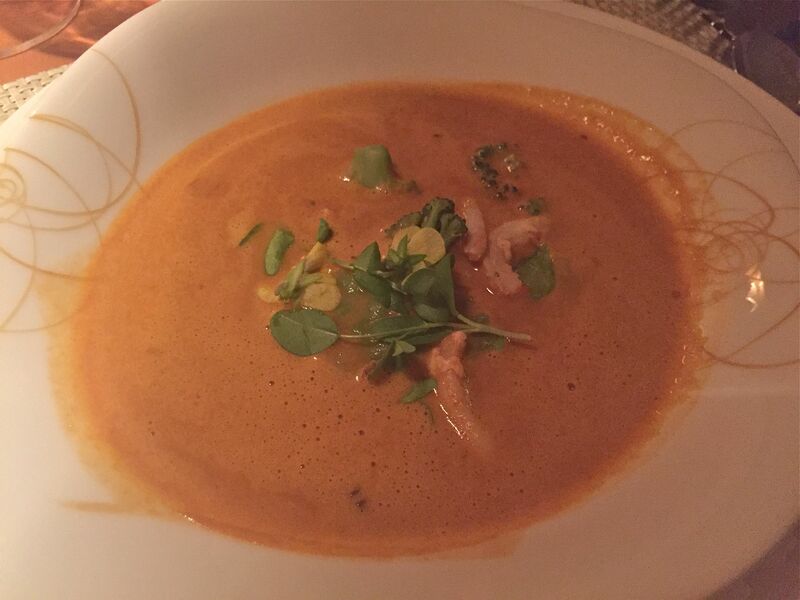 The crayfish bisque was served with a plump celeriac ravioli and spekboom leaves. It had amazing depth of flavour and lovely chunks of crayfish. Even with three options to choose from for mains I was having a crisis so I asked the waiter his advice. When he highly recommended the springbok my mind was made up and I didn’t regret it. I’ve eaten springbok a few times and this was the best one ever. Perfectly cooked medium rare it was tender, tasty and served with an exotic combination of mango and pumpkinseed salpicon (which means chopped up small I was informed), gnocchi and shredded mange tout. I cleaned my plate. As I’m speaking of plates I need to say how much I love the crockery here. It’s like each piece has been chosen specially (or even made specially) for the dish served on it. Such creativity and attention to detail makes a huge difference to the overall dining experience. Well impressive. 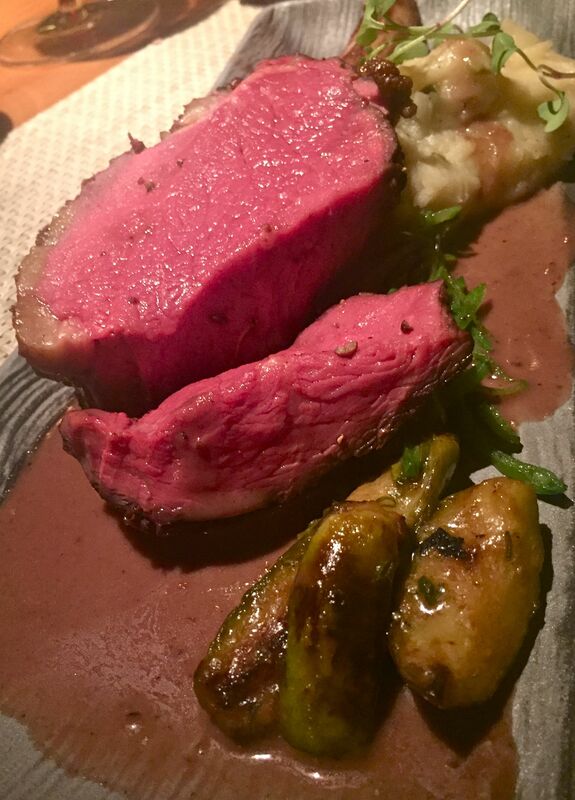 The beef prime rib was slow roasted on the bone and served with a green olive potato puree (absolutely spectacular) and a white pepper sauce. Again perfectly cooked with the lovely peppery sauce that went perfectly with the silken potatoes. A rather generous portion meant that my husband took the leftovers home in a doggy bag (box) and we had steak rolls for lunch the next day. Delicious they were, too. And then it was time for dessert. 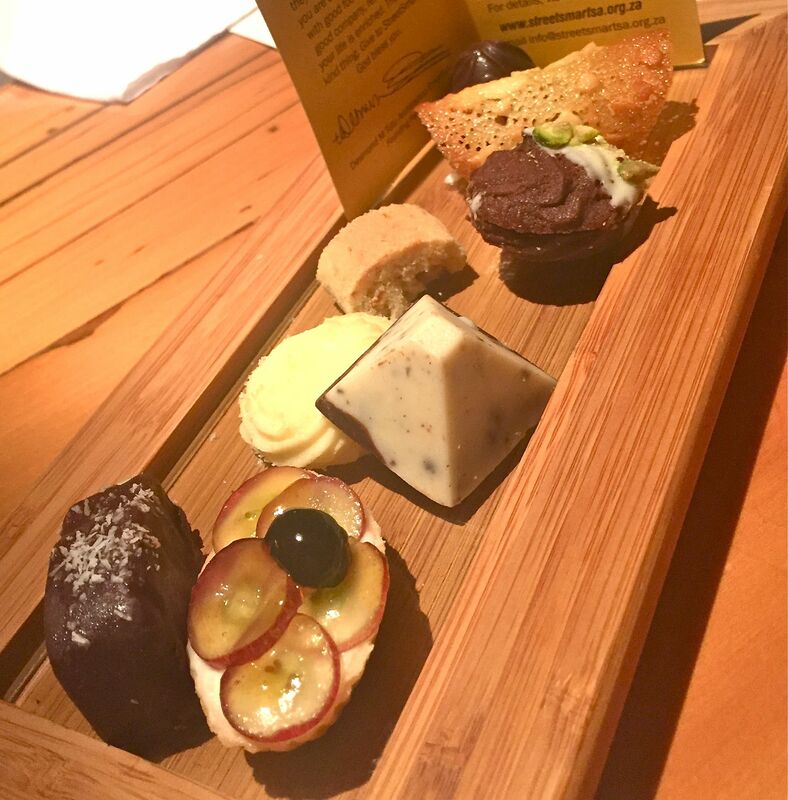 Despite being not much of a dessert person, I’ve learned my lesson – when you’re in a fine dining establishment such as Aubergine, you simply cannot look away from the desserts. They are going to be something to remember – which was definitely the case tonight. 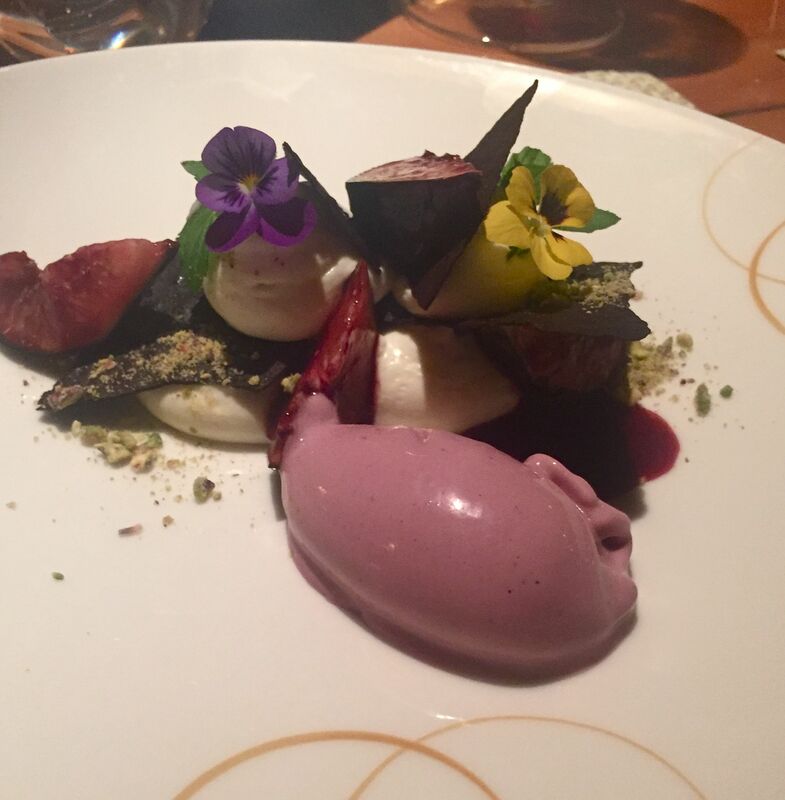 This beautiful plate of food composed of marinated purple fig, light mascarpone and cassis ice cream was a delight of sweetness and lightness. Okay, I cheated slightly and went for the cheese selection (how I love cheese). 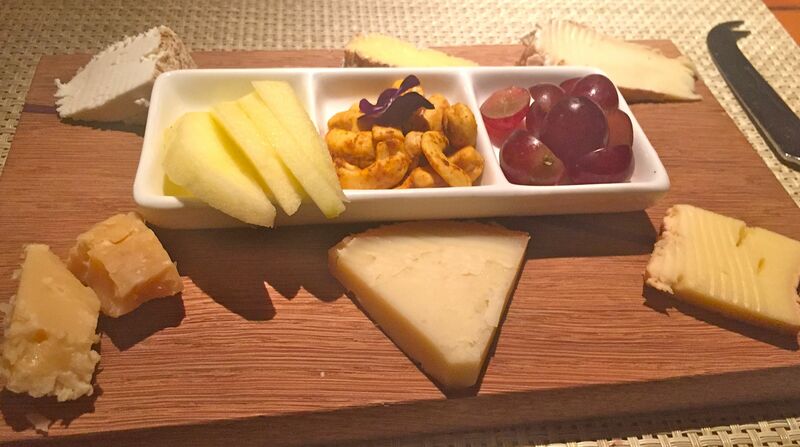 A mix of South African and international cheeses (six of them) were served with apples, grapes and chilli cashews. This is without doubt the best plate of cheese I have ever had. All beautifully mature and offering a wide range of cheesy flavours from delicate goat’s cheese to the strongest tasting of harder cheese. I loved them so much I had to contact the restaurant afterwards to confirm what they all were so here goes: Top row left to right, South African goat’s cheese, French Reblochon, French Camembert, Bottom row left to right: 4-year matured South African Boerenkaas, Swiss Tête de Moine, German Backsteiner. Now I know what to look out for ! If you like cheese, don’t even hesitate about ordering this, it’s the cheese of cheesy dreams! And then there’s the duo of creme brulee with fruit salpicon and sorbet. A long receptacle of delicious creaminess that had some of our party gasping with delight. The words “this is the best dessert I’ve ever had” even came out. What more can I say? 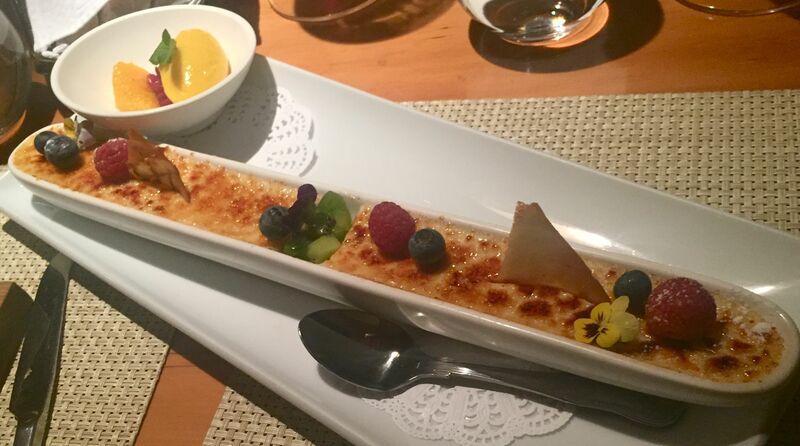 The best creme brulee in the world? Possibly. Even the petit fours to finish off the dinner were works of art and completely individual. There’s no doubt that Aubergine is just one of those places where you are going to love the food. It’s innovative without being crazy, every dish is perfectly done and the combination of courses was nicely balanced. 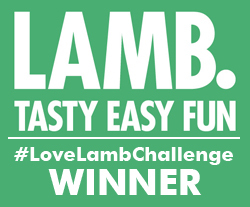 This is cleverly conceived of food cooked with love. And all our party loved it – it totally lived up to the expectations I’d built up in them (phew). There’s also an amazing book of a winelist, with options from all over the world. Chef Harald is serious about his wine and there are some proper push-the-boat-out bottles here…you can certainly go big if you want to. Okay, Aubergine is certainly not a cheap night out. But you’re looking at high-quality food in a unique style in an elegant restaurant with welcoming, efficient service. An all-round night to enjoy, it’s a real treat. Spot on Sandy……it was truly the best food we’d had!! Indeed Richard. I loved that amuse bouche, think I need to have a go at making spicy cauliflower soup. A really good dining night out!